If all the buildings ever constructed by humans throughout history could somehow be cataloged, my guess is that the majority would be made of wattle-and-daub. This simple technique has been used on every continent, by far too many cultures to list. 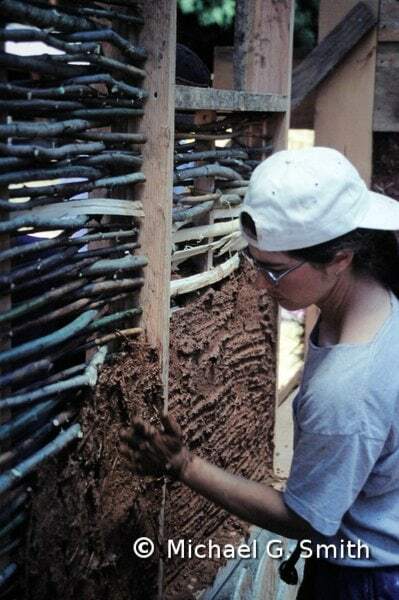 It involves a lath of woven sticks (wattle) covered on both sides with clay plaster (daub). The basket-like lath can be made of any straight and flexible material, including bamboo, milled wood, and coppiced hardwood staves. The daub consists of clay soil, moistened and mixed with fiber such as chopped straw or animal manure. Wattle and daub is often used as non-structural infill within a timber frame. As a thin earthen wall, it does not have particularly good thermal properties. Except in the mildest climates, I wouldn’t recommend it for the exterior walls of a heated home. But it has many other excellent applications, from interior partitions to the walls of unheated outbuildings.